This Albion War Service Homes Estate is historically and architecturally significant to the Melbourne metropolitan area and the City of Brimbank for its combination of a uniform architectural house style (although generally altered in detail) and an uncommon garden city-inspired plan which was atypical for both war service and privately developed estates at that time. This was one of several soldier settlement estates set up in Australia after World War One, possibly one of the earliest. It is of particular interest because of the initiative taken by H.V. McKay in offering to sell his land to the War Service Homes Commission and as the first example of Commonwealth intervention in the provision of housing in the Sunshine area. The simple gabled, weatherboard bungalow style houses are architecturally significant for their consistent form and design details, with characteristic wide eaves, steep pitched roofs and timber details such as eave and verandah brackets. While the houses are clearly designed and built to standard plans, the small variations, orientation to the allotments and subtly varied details indicate the attempts to create variety and avoid monotony in the designs. The layout of the estate is distinctive and unusual with its small corner and central roundabout reserve, planted with a large palm, and the large reserves enclosed by back fences of the houses in a manner reminiscent of Walter Burley Griffin's pioneering town planning at Eaglemont and Avondale Heights. The estate is composed of gabled roof simple Bungalow style weatherboard houses, of a very consistent form, with the majority of the houses still intact, although some with minor alterations. Most are well-preserved with some intrusions (new flats). 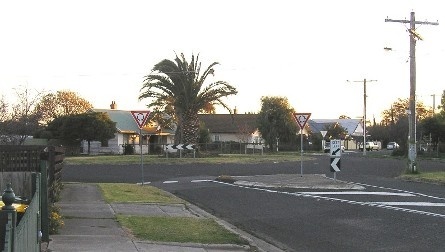 The houses are formed around an unusual Garden City Movement-inspired Y-shape street pattern, some houses backing onto oblong, five-sided `Recreation Reserves' as common open spaces, as well as the circle at the intersection of Coolamon and Bazentin Streets. Apart from the internal commons there are some basalt-pitched drains and a lane, and small grassed reserves at the Kamarooka and Hamel Streets corner. The original plan has 4 small reserves of this type at the angles made by Sydney St to the Bazentin and Hamel Streets corners. 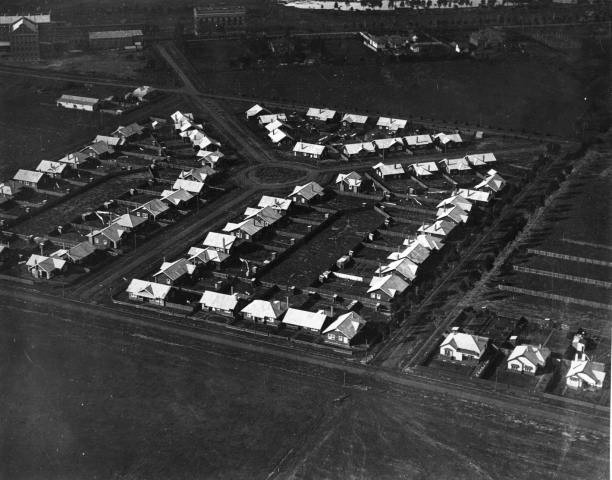 The War Service Homes estate plan is reflected in the larger street pattern, which radiated from the eight-sided Selwyn Park, in a faceted street layout reminiscent of estates on the Mornington Peninsula created around the 1920s by Saxil Tuxen. 7 Bazentin Street, oiled unpainted weatherboard appears to be a reclad war service home, 1920s-? 45/45A Sydney Street - redeveloped, now two brick units. (see description) Some new brick flats but houses generally have only superficial changes which could be reversed. Most houses have overpainting of the originally stained weatherboards.